I’m probably not alone in struggling to find positives from last night. Despite teasing the idea the Cleveland Cavaliers would one-up themselves and come back from a 3-0 lead in the NBA Finals, said lofty hopes were eviscerated in Game 5. The Golden State Warriors were too talented, and dispatched Cleveland for good last night en route to their second title in three years. For hurting Cleveland fans, the best I can offer is a reminder of how rough today would be had the Cavs not won their first championship in franchise history last year. Had the Warriors prevailed in that series as well, today would just be seen as more proof Cleveland could never beat them, forcing certain drastic moves. While memories of 2016 will always be great to fall back to, it’s still tough to accept what happened last night. The Cavs’ loss felt inevitable, thanks mostly to Golden State’s addition of Kevin Durant. Cleveland fought hard, but in the end just never had an answer for the Warriors’ overwhelming firepower. 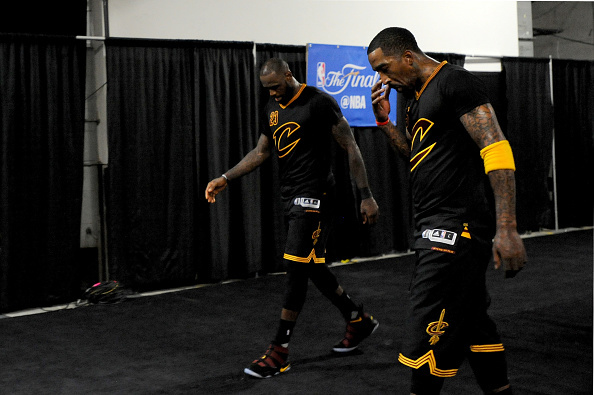 This feeling of helplessness is certainly resonating as the Cavs prepare for the offseason. Despite steamrolling the Eastern Conference, Cleveland had no answers for Durant and the Warriors. The goal for the summer will be to make the necessary improvements to set the team up for a better showing should it meet up with Golden State again next year. There’s just one problem. At best, such a task will be extremely difficult. At worst, it’s impossible. The Cavs, as currently constructed, are good enough to beat almost every team in the NBA. Likewise, the Cavs, as currently constructed, got run roughshod by Golden State and would likely meet the same fate with the same roster next season. LeBron James, Kyrie Irving and Kevin Love can only get Cleveland so far. In this instance, “so far” was five games. Well, you might think, clearly the team has to make some moves this summer. Golden State signed Durant, therefore the Cavs should counter that. First of all, the architect of Cleveland’s roster – GM David Griffin – remains unsigned. The first item on the team’s agenda has to be re-upping him, as he’s done amazing work putting together this title contender. Provided the Cavs do retain Griffin, his summer agenda will be unenviable. Somehow he has to make changes significant enough to contend with Golden State, yet also do so knee-deep in cap hell. The Cavs are well over the salary cap, thanks in part to having three max players on the roster. While many of the team’s bench members are heading to free agency, their departure hardly provides much relief. Free agency, in general, seems like a difficult route to take. Regardless, Cleveland has to get younger and more athletic this summer, otherwise it’ll once again be no match for the Warriors. Again, though, how can the team actually do this? Unfortunately, Cleveland has no choice but to utilize the trade market. While Iman Shumpert seems easy to move, it’s tough to believe he’ll net much of a return. The same can be said of prospect Cedi Osman, though the Cavs been hesitant to deal the young Turk since he seems ready to join them next season. The lopsided Finals defeat may force the Cavs to get desperate. You’ll undoubtedly hear Love’s name repeatedly this summer, as he’s always Cleveland’s most popular trade chip. The team may even try to see what it can get for Tristan Thompson. To those who demand such deals, you should know it’s practically impossible to find a situation where the Cavs part with Love and end up better. No club will trade for Love by parting with a better player. There are no “Love-for-Anthony Davis” deals out there, so don’t pretend otherwise. The idea of Thompson netting improved returns is lofty, too. He brings defense and rebounding, but not much else. Toss in his unfavorable contract, and you’ve got yet another trade which only sounds good on Cleveland Twitter. To summarize – the Cavs have to improve their roster or risk suffering another Golden State slaughter next year. The Warriors aren’t going anywhere, as their core is young and won’t be disbanding anytime soon. However, Cleveland doesn’t have the cap space to sign any notable free agents and isn’t exactly in a position to trade for talent upgrades. The team can make tweaks to its bench, but will that be enough to take down Golden State? It may be easy to say ” the Cavs just need to get better this offseason.” Their ability to do so, though, is extremely limited. Any major upgrades will require significant sacrifices, and even that might not be enough. It’s not a situation I envy. And yet, the team doesn’t have much of a choice. It either finds a way to navigate the salary cap and make significant improvements, or it endures another season where second place is the best possible outcome.